There’s a lot of talk about the internet of things (IoT) these days and savvy businesses are jumping on the IoT bandwagon. And for good reason: IoT is a competitive differentiator that can add real value. But understanding what IoT is, what the opportunities are, and how to get started can be a stumbling block. 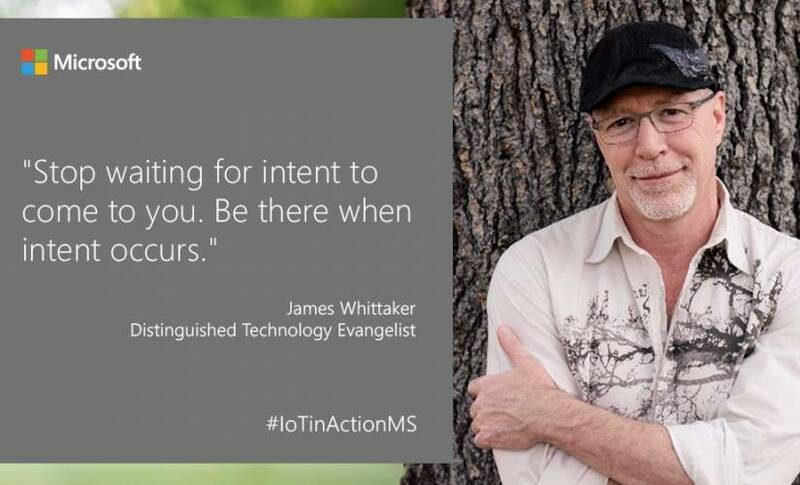 In this Q&A article, distinguished Microsoft engineer and IoT enthusiast James Whittaker shares his perspective. Meet him in person at the IoT in Action event in San Francisco on February 13th. In a nutshell, what is IoT? We’re all familiar with the internet of computers and how they are all connected. They talk to each other and they do useful things with data. It’s the same with our things. Think of IoT like the internet of refrigerators, the internet of buildings, or the internet of thermostats. It’s all about ordinary, everyday objects that communicate and do useful things with data. Take my hot tub, for instance. My hot tub is now able to self-maintain: it manages and orders its own chemicals, it adds water, it opens and closes its own lid. So, it’s really about machines becoming responsible for themselves. Self-aware, task-aware, human-aware machines. What are some commercial IoT opportunities? The key to taking advantage of commercial IoT opportunities is approaching consumer needs differently. Instead of creating an app that needs to be found and downloaded, companies must figure out how to meet consumer needs seamlessly, without using a browser or a search engine or other human intervention. Which opportunities are there for the Microsoft partner ecosystem to expand with IoT? The partner opportunity centers on owning the data and knowing what data will solve problems for customers. Let’s use the travel industry as an example. Right now, the travel industry is waiting for a consumer to visit their website or download an app to look at flights and hotels. But they shouldn’t have to do that. A partner should be able to pick up that intent to travel immediately wherever it happens and then be able to do something about it at that very moment. And that comes down to data. Getting the data in the cloud and then picking up the intent where it where it occurs in the real world is where partners are critical. What advantages does Microsoft offer IoT partners? From a data standpoint, Microsoft has an end-to-end solution: a place to store data and a place to analyze it. Microsoft has a massive amount of experience with data. Bing is one of only two indices of the world’s information. We’re used to serving it at scale, and we’re used to dealing with it scale. And then of course, there’s Azure. Because Azure offers built-in artificial intelligence (AI) and built-in machine learning (ML), a partner doesn’t have to write machine learning or be an expert in AI. Meanwhile, behind the scenes at Microsoft, we’re constantly making improvements. We’re experimenting, tinkering, and solving our own problems and then using our learnings to keep advancing our offerings. Finally, Microsoft is partner-oriented. Partners build stuff on our platforms and when they succeed, we succeed. We’ve always made our money after someone else has already gotten paid. That’s what I like about this company. How can we learn more about IoT? Right now, Microsoft is hosting a fantastic series of IoT in Action events. These free, one-day events are all about making connections between companies and partners and helping companies get started in IoT. Attendees will get to see an IoT solution emerge from concept to reality in real time. They’ll gain insights into market opportunities and scalable IoT solutions. They’ll also get expertise from other IoT pioneers. The next IoT in Action is set for February 13, 2018, in San Francisco, CA. View this short video, take a look at the agenda, register today, since space is limited.